I don't know why - but I have always wanted to stay in a yurt. So when we looked at sneaking off for a little weekend trip, I googled places where we could stay in a yurt. We decided on a Jellystone campground in Tabor City, NC. Our yurt was called Fox Den. It had a large porch (behind) and a picnic table and fire pit. While the yurt did not have a bathroom, we had our own private bathroom in a bathhouse. The yurt offered a/c and a ceiling fan, so it was nice and cool. The inside was roomy enough for beds and chairs. And on the day we had a massive two hour storm, we were nice and cozy in the yurt, where the boys watched a dvd on my laptop until the weather let up. The thing they liked best about the yurt? Plenty of space outside to ride their bikes in circles around the yurt. Cort wore his Teenage Mutant Ninja Turtle costume over his clothes the entire time. When you go camping, you should always bring your ninja gear. How about you, readers? 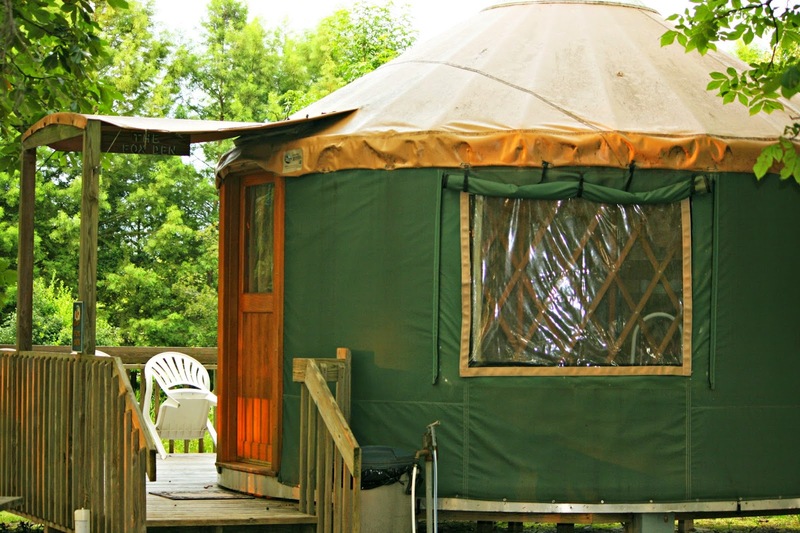 Would you like to stay in a yurt? 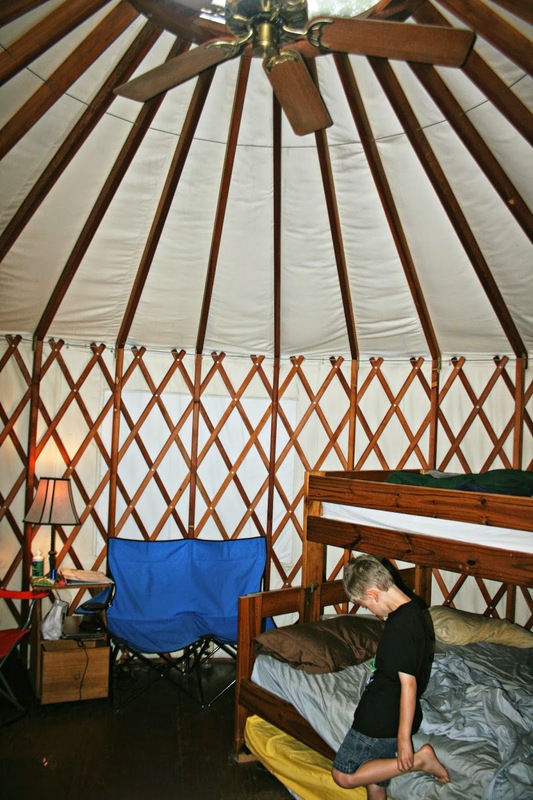 I think staying in a yurt looks like a lot of fun! I have seen those for sale at the green living event in Roanoke and I think they make them near Floyd. They look pretty sturdy and I think some have wood stoves. You may want to just move into one when you retire, then the boys will come visit and ride their motorcycles around it. Just a thought. Oh I love yurts! I tried to convince my husband to let us live in one...it hasn't gone over so well :-) We know several families in Maine that live in them, and love it. Looks like a fun time! Very cool! I have a friend who yearns to live in one. I see the appeal. I have never even heard of a yurt until now. How cool! I have always wanted to stay in a Yurt ever since I was aware of them! There are two or three in the area and they are huge, but I think not for renting. Did you eat out? How long did you stay? Your pictures are really good, I love Cort riding around in his costume!! There is a family here in town who LIVE in a yurt. It is considerably larger than your vacation yurt, with bathroom and kitchen, two bedrooms, etc... really a lovely space if you can be organized with your "stuff". I've never even heard of a Yurt but I would love to stay in one. Going to have to research this one and buy some ninja gear too! i have never even thought of it before but what a neat idea! now we're gonna have to try this! I'd love to stay in a yurt! Here in Ireland I have seen a yurt being used as a storytelling venue for children. I didn't even know what a yurt was. You are just having way too much fun this summer. We stayed at a Flintstone park one time in South Dakota. it would be so fun! I have a blogging friend who lives in a yurt. They built it themselves and it's incredibly beautiful. It's my dream to go visit them. How fun to camp in a yurt for the weekend! Much better than a tent when it is raining. What a fun excursion! You're doing things with them they'll remember forever!! Love the Ninja costume. Too cute. I have not stayed in a yurt but it looks like a lot of fun. I would try it. I did not know what a yurt was so thanks for the education. 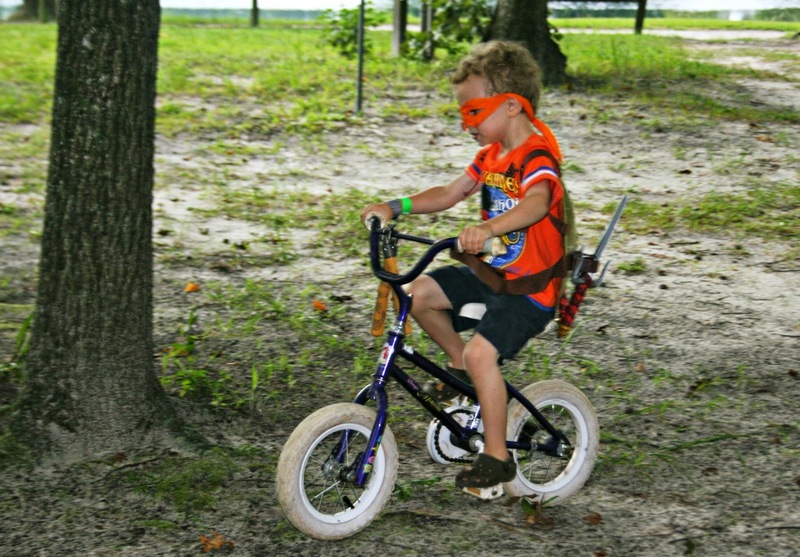 I think your son may be a fashion trend setter--ninja turtle gear will be essential for camping soon. Looks like fun! A form of glamping. It looks fun to me. My boys always have some costume on as well. It's so funny!